Meet Bettie Bee, a Thriving Newborn Kitten That Literally Has Two Faces – Sig Nordal, Jr.
December 22, 2017 December 23, 2017 Sig Nordal, Jr. In many ways, Bettie Bee is an ordinary newborn cat. The tabby-colored feline has four paws, two ears, and a tail. That, however, is where the similarities end. Bettie is known as a Janus cat, a term for a feline that has two faces—literally. Her head has two noses, two mouths, and three eyes. Bettie’s extra face is the result of an extremely rare congenital condition called craniofacial duplication that causes certain facial features to double in the womb. After Bettie was born, her owner knew that she would need extra help. Due to the additional mouth, it meant Bettie would have a difficult time nursing normally, if at all. The owner then brought the kitten to a rescuer who has experience in taking care of special-needs cats. “She was born on December 12 and I went to fetch her the very next morning,” the rescuer (who wishes to remain anonymous), told The Dodo. “I took her to the vet that day and his first opinion was to put her down. But she was, at one day old then, very feisty. We wanted to give her a chance. And she’s been thriving.” Bettie’s rescuer has been feeding her via a tube, and she discovered that both mouths led to the stomach. Although a two-faced cat like Bettie is certainly an anomaly, there’s a chance that she will grow up to live a healthy life; in one case, a Janus cat named Frankenlouie passed away after 14 years. With love and care, Bettie will hopefully have the same. You can follow along with her incredible story, too. The rescuer has set up a Facebook page for the little kitty, who is already becoming a worldwide sensation at barely a week old. Meet Bettie Bee, a tiny kitten who is gaining worldwide fame for her unusual looks. She’s a janus cat, a two-faced cat that has two noses, two mouths, and three eyes. This could result in some health difficulties, but so far the young kitten is thriving. All images via Bettie Bee. 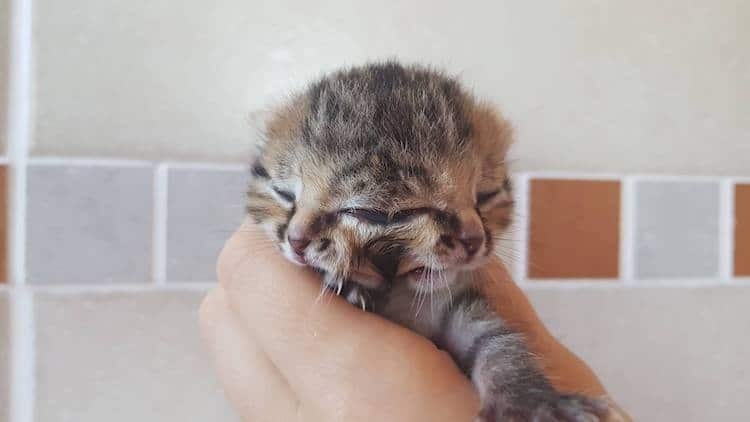 The post Meet Bettie Bee, a Thriving Newborn Kitten That Literally Has Two Faces appeared first on My Modern Met.